and 2 lbs of stewing beef. Do you love our famous lean ground beef? Order it in quantity, and save 20% off the individual price. 10x one-pound packages of ground beef, individually vacuum sealed. Shipped frozen to your door. A $169.50 value — save $34.50. 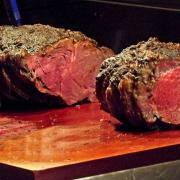 The tenderloin roast, or Chateaubriand, is absolutely the most tender, melt-in-your-mouth roast beef available. It is extremely fine grained, and prized by top chefs for its buttery texture. 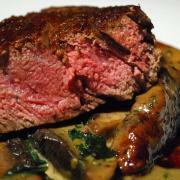 Tenderloin needs to be relatively well seasoned, with good browning, to bring out its flavour. Sold as a 3-pound roast. Available in grass-fed or grain-finished beef. If you have a chest freezer, and tend to enjoy a delicious beef meal at least a couple of times a week, then your best value is to order a side or half-side of Whispering Meadows beef. For most people, a side of beef will last you around a year, and will fill about a half of the volume of an average chest freezer. Compared to buying the same amount of beef individually, a side of beef will save you about $1,575. Your side or half-side will be custom cut to your specifications. It then gets packaged as individual cuts, labelled, and flash-frozen. We price both our grassfed and grain-finished beef at $7.95 per pound, dressed weight. Once butchered into individual cuts, that works out to about $12.70 per pound, cut weight. On average, each of our sides weighs around 340lbs of beef, and half-sides about 170lbs, hanging dressed weight. To order, we take a deposit of $125 for a half-side, or $250 for a full side. Your balance will then be calculated from the actual weight of your side, minus deposit. Your deposit secures your order, with the balance due on pickup or delivery. …and save 20% off the regular price at the same time. 60g (2.1oz) packets of Smoky BBQ — a barbeque-flavoured beef jerky with a mild spiciness, a rich mouthfeel, and a hint of smoke. 60g (2.1oz) packets of Asian Fusion — inspired by Thai, Szechuan, and other Asian cuisines, a unique blend of flavours with just a little heat. 60g (2.1oz) packets of Aztec Spice — medium spicy with a mole poblano flavour profile that takes its inspiration from ancient Central American ingredients. The prime rib roast is considered to be the juiciest, tastiest roast that money can buy. It is exceptionally well marbled, bursting with rich flavour. Beef just doesn’t get any better than this — it’s the king of roasts. Sold as a 3-pound roast, either grass-fed or grain finished. The top sirloin roast is fine-grained, tender and juicy, with finer veins of marbling than a prime rib roast. It is always a crowd-pleaser, and it’s the classic meat that most people imagine when they think of roast beef. The brisket has long muscle fibres that become soft and tender when cooked low and slow. As long as that simple guideline is followed, you will get a falling-apart tender roast with fabulous flavour. The best way to cook a brisket is with moist heat, by either braising, pot-roasting or simmering in a liquid. A pot roast should be cooked until fork-tender or well done. It makes its own delicious sauce while cooking and can be made a day ahead, re-warming nicely in its own gravy. You can place your brisket in a crock pot or dutch oven while it’s still frozen, with about 1/4 cup of water and an onion quartered into chunks. Put it on low heat in the morning, and by dinner time it will be ready to eat. For a complete meal, throw in some whole or halved potatoes, diced carrots, and your other favourite vegetables and herbs with the frozen roast. To serve, slice across the fibre of the meat. 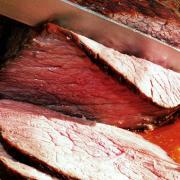 Our brisket roasts are approximately 3.5 pounds, vacuum sealed. Shipped frozen to your door. Tenderloin steak is also commonly known as fillet mignon or chateaubriand, and is THE most tender cut of steak. These fillets are cut from the large end of the tenderloin. Tenderloin steaks have very little marbling, and for that reason they are best marinated, cooked hot and fast, and served rare to medium after resting for 10 minutes or so. This is also the classic cut for making beef stroganoff or steak tartare. It is considered to be the absolute best, most premium cut of beef. Approximately 10oz (0.27kg) per package of two tenderloin steaks. Available in grass-fed or grain-finished beef. This is one of the more prized steaks, also known as the Porterhouse. If the bone (which is in the shape of a “T”) was cut away, you would be left with the tenderloin (or fillet mignon) and the Striploin steak. So the T-bone is one of the premier cuts of beef. Keeping the “t-bone” in the steak also improves the flavour of this exquisite cut. One T-bone steak per package, cut 1” thick. Approximately 16oz (0.45kg) each. This steak is extremely well marbled and is melt-in-your mouth delicious cooked medium-rare. Most steak aficionados will tell you that this steak must be grilled! The rib-eye is the steak version of the prime rib roast. One rib-eye steak per package, cut 1” thick. Approximately 10oz (0.27kg) each. A premium “low and slow” beef roast, perfect for sous vide, reverse sear, or your slow cooker. Compared with a rib roast, the blade roast is a little meatier, with more of a robust beefy flavour. For best results, this cut should be enjoyed after roasting at a low temperature for as long as possible, then searing at high heat. The meat will be fall-apart tender, with incredible flavour. A great value! A premium “low and slow” beef roast, perfect for sous vide, reverse sear, or your slow cooker. Compared with a blade roast, the short rib roast is a little more tender, with a slightly more delicate flavour. A premium “low and slow” beef roast, perfect for sous vide, reverse sear, or your slow cooker. Compared with a blade roast, the cross-cut rib roast is a little more tender, with a slightly more delicate flavour that’s closer to short ribs. 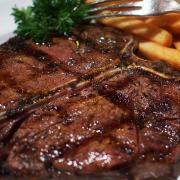 The strip loin, or New York Strip, is the same cut as the larger side of a T-bone steak. It is a favourite of many chefs for its succulent flavour and fine-grained tenderness. Fire up your grill for this one! One steak per package, cut 1” thick. Approximately 10oz (0.27 kg) each. We’ve taken our amazing lean ground beef and created pre-shaped hamburger patties, so you can be grill-ready at any time. If you ever need a quick and easy meal, having them in your freezer will get your family fed in minutes. These ready-to-use patties are just under a half-pound of pure ground beef each, with zero fillers. We make our ground beef from extra pieces of our other premium cuts, and we leave in just enough fat to give your burgers maximum flavour without being at all greasy. We vacuum-seal our burger patties in 4-packs, separated by wax paper. You can order by the 4-pack, with quantity discounts if you order multiples of 12 or 24 patties. Each patty contains 6.7oz (189g) of our pasture-raised, drug-free, grassfed or grain-finished Black Angus ground beef — and nothing else. We price them at the value of our ground beef, and we save you the work of forming them into patties at no extra charge. Available in grain-finished or 100% grassfed beef, vacuum sealed in 4-packs. Each 4-pack contains 1.67lbs (758g) of beef. Shipped frozen from our farm to your door. The skirt steak is traditionally used for fajita meat. Similar to the flank steak, it is a very lean cut with long muscle fibres that need to be cut thinly across the grain. The skirt is considered a slightly better cut than flank because it takes up the flavour of a marinade better and gives a more tender finished beef. 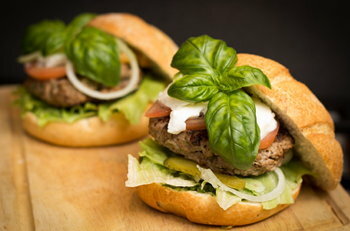 It is not only excellent in fajitas, but also in sandwiches or as a salad topping. Marinate for at least a half hour, or overnight if possible. Cook 3-4 minutes per side and cut thinly across the grain. 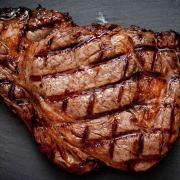 This popular cut is technically not a steak, but has become commonly accepted as one. Flank steak is cut from the belly muscle of the animal, which makes it a very lean cut of meat with little marbling. It is tender and delicious when cut thinly across the grain. Marinate for a minimum of a half-hour, grill for 3 to 4 minutes per side, let rest for 5-10 minutes, and slice very thin across the long fibres of the meat. Serve with your favourite rice or potato dish, or wrapped in flat bread stuffed with your favourite cheese & roasted veggies, or on top of a salad. One flank steak per package, approximately 1-lb (0.45kg). This cut is thick, tender and juicy. It is sometimes referred to as Top Sirloin or Tri-Tip Steak. It is great barbecued, or it can be broiled in the oven. 1 sirloin steak per package, cut 1” thick. Approximately 10oz (0.27kg) each. Beef cheeks are a unique, gourmet cut of beef that have become popular with fine-dining chefs in recent years. They yield a rich and highly flavourful meat dish that is so tender it literally falls apart by itself. Beef cheeks need to be slow-cooked for at least 4 hours, usually in a marinade. They can be served on a bed of rice or quinoa, on a bun, or with baby potatoes, to name just a few options. 2 Beef Cheeks per package, approximately one pound. These fast-frying beef cutlets are cut from our lean and tender round and sirloin tip steaks. Add them to a stir fry for a hearty meal, or they are also perfect for sandwiches, wraps, fajitas, tacos…. anywhere your imagination can put them! Approximately 8oz (0.23kg) per package. The petite tender is also known as the shoulder tender, the teres major or the bistro filet. It is a relatively thin strip of muscle from the shoulder, and is unusually fine-grained, with a lot of the same characteristics as tenderloin. In fact, many people consider this cut to be the second most tender part of the whole animal, after the filet mignon, and at a lower price-point. 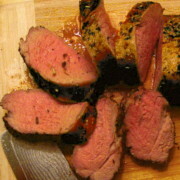 You can use the petite tender as a direct substitute for tenderloin in most recipes. It is usually marinated, and cooked hot and fast. It can also be used in beef stroganoff or beef tartare. One whole petite tender per package, about 10oz. Oxtail makes incredibly delicious soups and stews, with melt-in-your-mouth meat and a unique rich flavour. At one time, oxtail was considered a “cheap” offcut, but now it is recognized as a gourmet specialty product that is generally hard to find. Especially from a naturally-raised and grass-fed source! Slow-cook your oxtail in a stew or marinade, or roast it for several hours, to produce a rich and flavourful meat that literally falls apart. Oxtail is actually quite similar to beef cheeks in many respects but takes just a bit more work to remove the extra fat and bones after cooking. You won’t believe the rich, steak-like taste of our lean ground beef. We grind it from extra pieces of our other premium cuts, which are trimmed off while we’re cutting our steaks and roasts. And we leave in just enough fat to give it maximum flavour, without making it at all greasy. Everybody raves about the burgers, sauces and chili they make with this ground beef. It will add a new dimension of flavour to all your favourite recipes. Also available in a bulk pack of 10x one-pound packets for 20% off, and you can also get them pre-formed into burger patties at no extra charge. Our ground beef is sold in one-pound packages, individually vacuum sealed. Shipped frozen to your door. Our beef cubes are made up of the best lean offcuts from our steaks and roasts — left over from when our butcher cuts up a side of beef. It is the exact same all-natural, tender and delicious Angus beef that you know and love, just cubed into mouthwatering chunks for gourmet stewing or juicy kebabs for the BBQ. Each package is one pound of beef cubes. Our Aztec Spice beef jerky is medium spicy and has a flavour profile that takes its inspiration from ancient Central American ingredients. It’s infused with a gourmet mole poblano flavour, using only certified organic seasonings. We hand-make this jerky in small batches from our all-natural Black Angus beef, which we raise without drugs or antibiotics and feed on a luscious blend of organically-grown grasses. Our Asian Fusion beef jerky is inspired by Thai and Szechuan cuisines, with a rich mouthfeel and a touch of heat. It’s made from our all-natural Black Angus beef, which we raise without drugs or antibiotics and feed on a luscious blend of organically-grown grasses. This jerky is artisanally hand-made in small batches, and it’s very high in protein with minimal fats and carbs. We hope you’ll find it to be a treat both for your health and your palate! Smoky BBQ is a gourmet barbeque-flavoured beef jerky with just a touch of spiciness, a rich mouthfeel, and a hint of smoke. We hand-make this jerky in small batches from our naturally raised beef. We hope you’ll find it to be a treat both for your health and your palate!